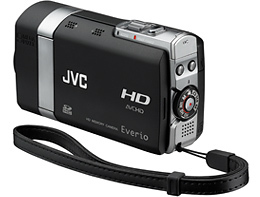 The design of Everio X is a distinct departure from other camcorders, including other Everio models. Not much larger than a smart phone, Everio X is a slab-sided rectangle without the handgrip, protrusions or indentations found on most camcorders. The design allows plenty of flexibility in how the camera is held — from below, above, or whatever suits the situation and the user's preference. 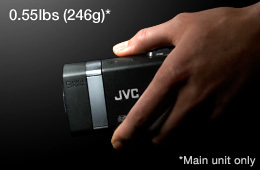 At the heart of the camera's superior image quality is a 1/2.33-inch 10.3 Megapixel CMOS sensor — the world's first to be used in a Full HD AVCHD camera*. The high quality 9 Megapixel digital stills the camera shoots correlate directly to the un-interpolated performance of this CMOS sensor and Bayer array RGB color filter. For the first time ever, this 10.3 Megapixel CMOS sensor is the source of 1920x1080/60i Full HD AVCHD format video. The camera records at a stunning 1000 TV lines of horizontal resolution — the theoretical maximum level of 1920x1080 Full HD. 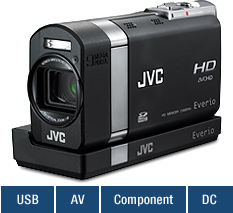 Everio X offers high-speed shooting, similar to the motor drive function found in some mechanical still cameras. 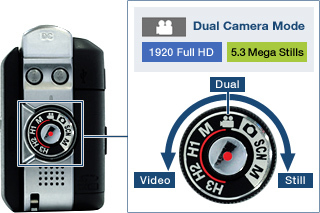 Up to eleven 5.3 Megapixel stills can be shot at 60 frames per second (fps). 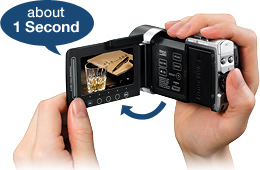 A great way to capture fast-paced action in high quality digital still images. For continuous stills with even higher image quality, you can also shoot as many as six non-interpolated 9 Megapixel stills at up to 15 frames per second (fps), a speed that rivals or surpasses what's offered by typical 9 Megapixel DSLR cameras. The camera's high-speed recording function shoots ultra-slow motion video to capture dynamic movement that is not visible to the naked eye. Any one of three speeds — 120 frames per second (fps), 300fps and 600fps — can be selected; the faster the recording speed, the slower the playback motion. With this function, approximately 2.4-second bursts of video are recorded that are then played back over a period of up to 24 seconds, providing an effective tool for sports technique analysis and nature studies. 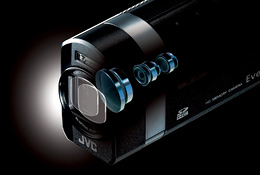 JVC's new proprietary optical image stabilization (OIS) system applies camera shake compensation optically using prism technology at the lens entrance to ensure effectiveness throughout the zoom range and allow high quality shooting without a tripod. Everio X also allows shooting of 1920x1080/60i Full HD video and 5.3 Megapixel stills at the same time — a unique advantage of this all-in-one camera. This way, you won't have to exit the Video mode each time you want to take a still image, thereby minimizing the chances of a missed shot. The One Touch Upload function, when used with the included software for Windows®, simplifies uploading videos to YouTube™. Simply connect Everio X to a PC using the provided USB cable, and press “UPLOAD”. The software launches automatically, converts the footage file and uploads it to YouTube™. Note: YouTube and the YouTube logo are trademarks and/or registered trademarks of YouTube LLC. A One Touch Export function provided by bundled software for Windows® makes it easy to export videos into iTunes® for playback on an iPod® or iPhone®. Simply connect Everio X to a PC using the provided USB cable, and press “EXPORT”. The software launches automatically, converts the footage file and imports it into your iTunes® library. Note: iTunes, iPod and iPhone are trademarks of Apple Inc., registered in the U.S. and other countries. *Installation of bundled software required. **Burning Blu-ray discs not available with SHARE STATION®. 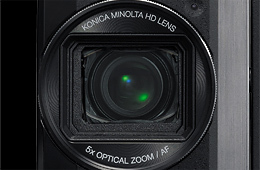 Everio X uses a new KONICA MINOLTA HD LENS with a 5x optical zoom, and magnifies up to 8x without any picture degradation thanks to Dynamic Zoom technology. 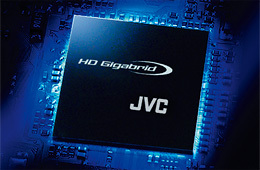 This super high-band processor enables high speed processing of the massive amount of image data output through the high resolution CMOS sensor. 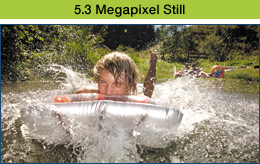 Full 5.3 Megapixel stills can be processed at 60 frames per second. It contributes to Everio X's beautiful images with more details and reality. This function outputs a 1080 scanning line image at progressive 60fps so you can enjoy uncompromising picture quality on a TV that accepts 1080P input. 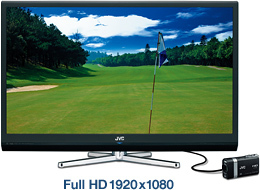 Provides increased color accuracy when connected to HDTV displays. x.v.Color and its logo are trademarks. Designed to operate similar to the mode dial on a DSLR camera, this unified dial allows instantaneous access to various camera, video and special effects shooting functions. You can also rapidly shift from one mode to another, improving your chances of capturing a scene the way you want it. 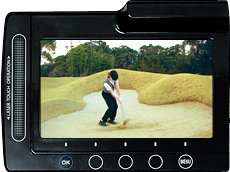 This innovative user-interface features a touch-sensitive slide bar that you slide your finger over to access various functions and select still and video files. 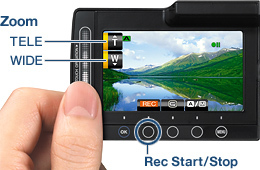 It also enables Zooming and Recording start/stop control in addition to the usual buttons on the top and rear of the camera. Intelligently detects up to 16 faces then accurately adjusts the focus and exposure for sharp, beautiful images. 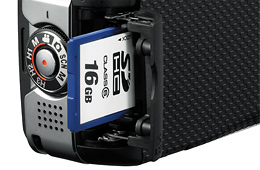 Everio X uses SD/SDHC Card, a readily available and cost-efficient media. 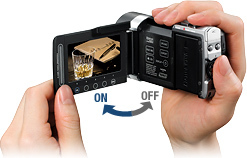 Just open the LCD; the power turns on and the lens cover automatically opens. Just close the LCD to power off and close the lens cover too. 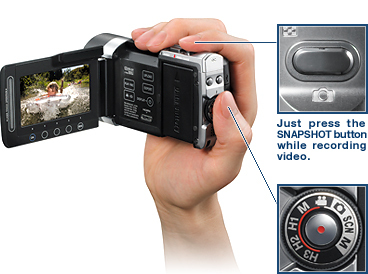 In combination with Auto Power ON, you're ready to shoot in about 1 second when the LCD is re-opened. Convenient docking cradle is provided for easy viewing, charging, and sharing. Convenient when carrying and holding the camera. Just turn the control dial to “SCN” and select the appropriate mode for the subject. 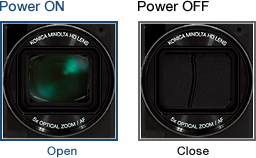 Optimal camera settings are made automatically.